The LMC meet at Mill Cottage might be the last winter meet of the year. 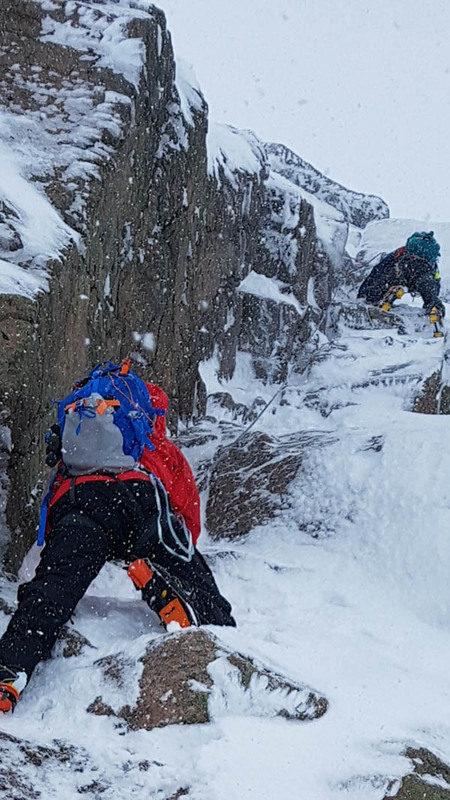 The winter had not been great so far, but the weather report suddenly turned in winter’s favour and the club members scrambled to be added to the list. I headed up on Friday night with Steven - we exchanged ambitions for the weekend; a climb at Sneachda on the Saturday and perhaps a munro on the Sunday. We arrived at the hut to meet Guy, Danny and new member Claire already in attendance. Michael, Cameron, Florian, Rob and Richard appeared soon after. Claire was an enthusiastic new member, but asked if we could assist in adjustment of her crampons. To me they looked a bit like they could have been found at the bottom of the Eiger with someone’s feet still attached, but the more experienced members reckoned that they were still good enough crampons but the adjustment mechanism beat all attempts at amending the fit, so Claire was resigned to doing something un-technical. Cameron, on the other hand, was showing off his new fancy winter boots. They did look smart and I eyed them enviously. We began to plan for the next day, we were wary of the crowds as we imagined hordes of desperate, winter starved climbers marching into the corrie and jamming up the climbs. As we all began to work out routes, it became apparent that we were all heading to the exact same part of the corrie, so the hordes we would face would be each other. I think we all secretly conspired to be the first team on the route..
"looks like a guid route, oh hing oan, book 's upside doon"
In the morning, we walked out from the ski centre into the face of the corrie. Danny was optimistic that we were well ahead of the other Lomonders and we would get first choice on any route. But our primary intention was to do Hidden Chimney Direct, a IV 5. Just as the face loomed through the mist, I saw that instead of being first, we were dead last and the rest of the club were already in the last stages of putting on their gear. No worries, not a big deal, but maybe next time we’ll hide their car keys. We headed up to the base of the direct start. We congregated at the base of the climb and joined the queue. It was a busy day on the route but this route was busy with exclusively Lomonders, almost as if we had booked it out in advance. This became a pleasant social gathering and our numbers, and patter, kept other climbers away. Florian and Richard were attempting the Haston Line, which starts at the same point as our climb. 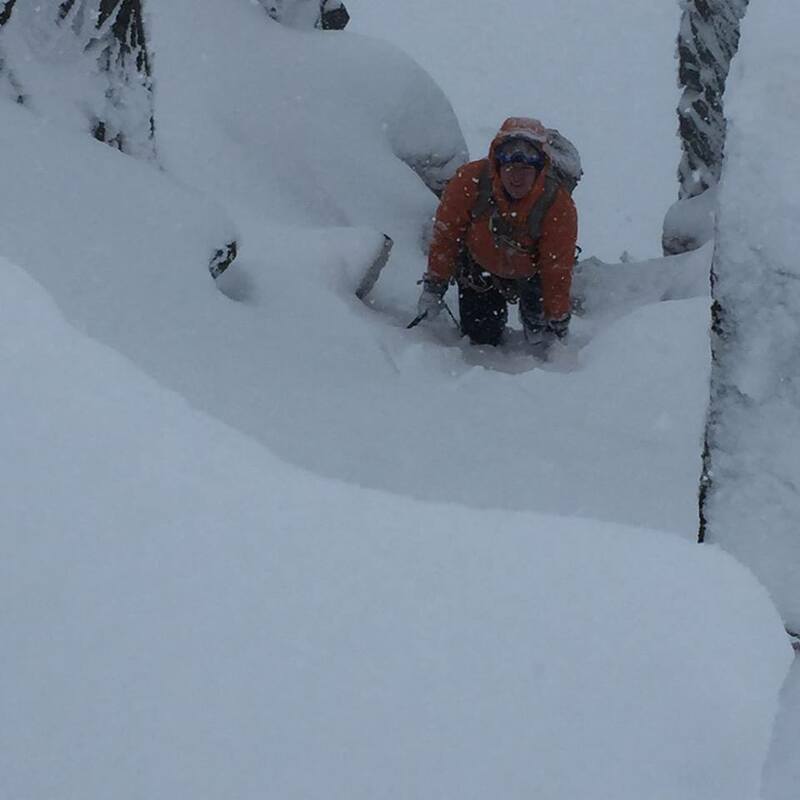 Florian found the route too hard going as there was so much powdery snow covering everything, so they headed up the gulley to go into the remainder of the Chimney Route by the standard line. Florian is an incredibly skilled climber, so this made me wonder a little about our own aspirations. We were a bunch of virgins getting out grade IV cherry popped with help from Danny and Michael, and some of us were even doing this as their first winter route. Michael was leading his team with Steven and Cameron. Once Michael had set up a belay, he tugged the ropes for Cameron and Steven to begin their climb. Steven began his climb but began to voice his doubts. Danny helpfully advised that instead he could tackle the grade 1 gulley to the side and meet us at the top. Looking over into the jaws of this gulley, spindrift and powder was pouring down it and teams on the route were fumbling around and turning back. Stephen’s initial doubts disappeared and he went back onto the route and climbed up. This was Cameron’s first winter climb and the first move was straight onto a grade V. I looked at Cameron’s snazzy boots again and began to wonder if they would fit me, but Cameron sailed up the route without much fuss. Once they were out the way, Danny led the first pitch which I belayed. Rob began his climb soon after and I waited for my rope to be tugged to being my climb. 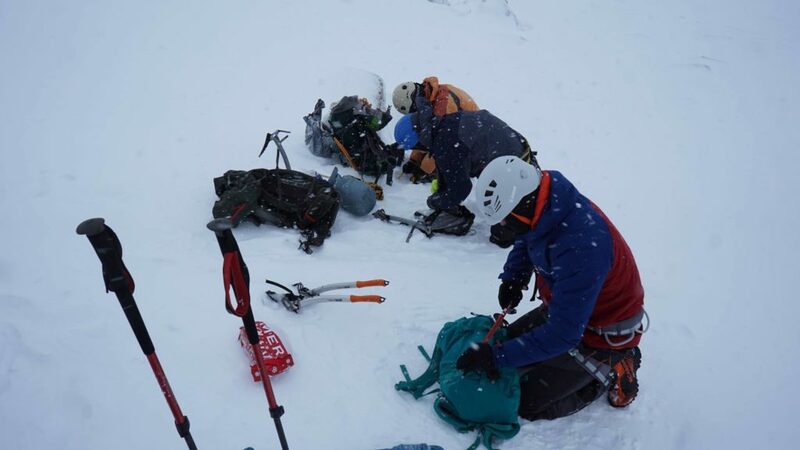 While waiting, a sizable winter skills group came up the gulley beside me and paused beside me to setup their climb. Perhaps expecting to see a demonstration of skill and something for their instructor to comment on, I began to wonder what they would make of my climbing ability which is typically desperate at best. Perhaps learning by other people’s mistakes? Thankfully the tug of my rope came much later than I expected and the group became impatient and moved out of sight. I was now alone on the face with nobody else in sight. 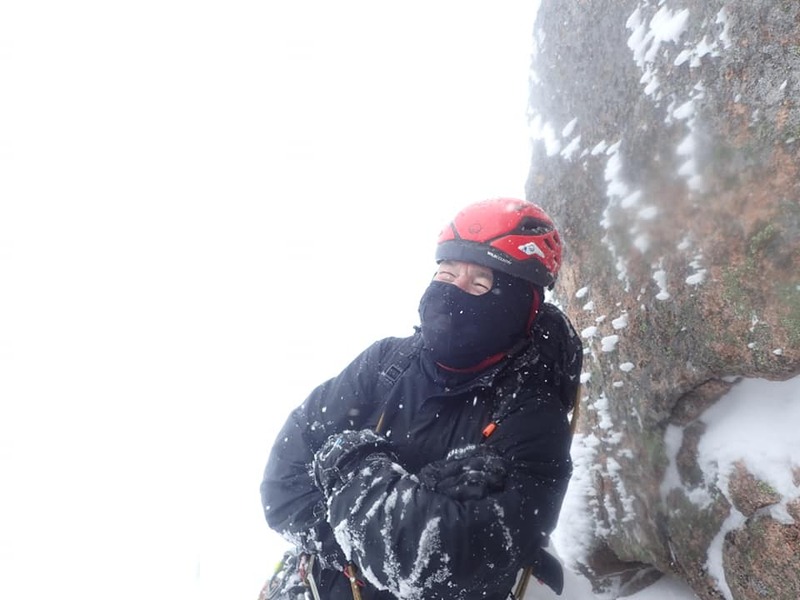 The visibility was low, but there was no wind, and the crag was peaceful. 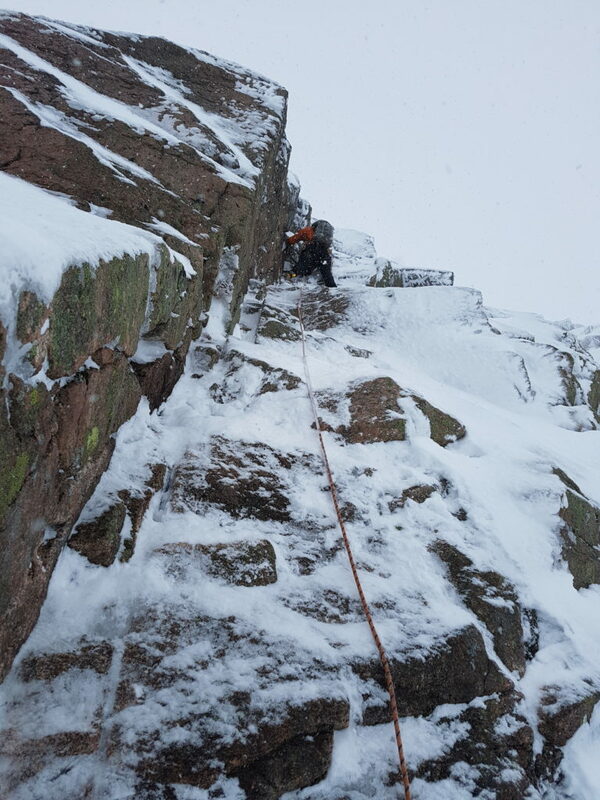 It might only be a ‘roadside’ winter crag, but still felt magical to me. My rope came live and tugged at me to ascend. 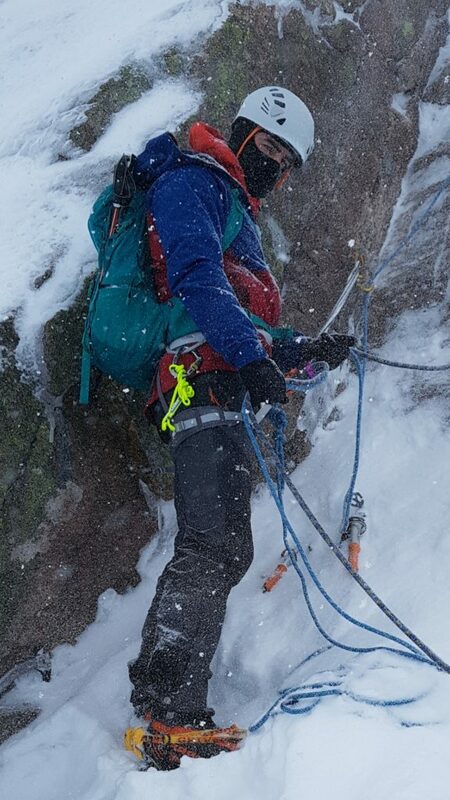 The first move looked a doddle, nothing like a grade V; it wasn’t even vertical and I couldn’t understand why others were scraping with their crampons and panting heavily when they moved past it. After scraping my crampons and panting heavily as I moved past it, I had to revise my initial thoughts. 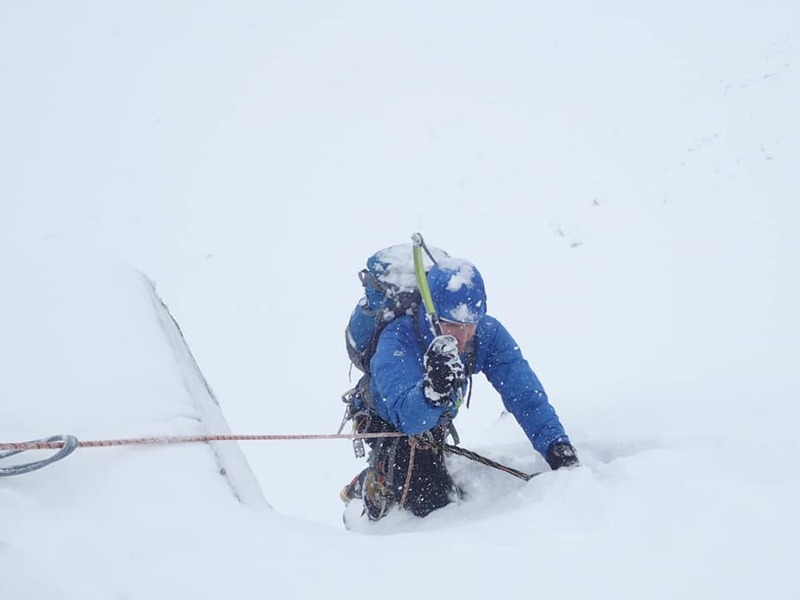 There was no consolidated snow, turf or neve to whack the ice axes into, instead the soft powdery snow felt like trying to gain purchase on multiple layers of down duvets, so hooking and torqueing the ice axes into the left side wall was the only way to progress. This would send me off balance for most of the route, with my feet wanting to barn door and swing out constantly, but this is how climbing normally is for me, so I ungainly carried on up. I was now beginning to make good progress up the route. This soon stopped as I managed to completely jamb my crampon into a chockstone. I was just about to move up over a bulge when I found that it was impossible to free my foot at all – I could feel my ligaments straining and sockets extending as a I pulled as hard as I could. I couldn’t see the boot as it was somewhere below the bulge. I tried to move down to unsecure my foot but the rope was being pulled tight as Danny must have thought that I was in need of some extra security. Shouts of ‘slack’ couldn’t be heard up at the belay. I wondered if my boot and crampon would now become a permanent insitu feature into the rock and began to picture how the rest of the climb would be with one bare foot. I wiggled the foot around for a while and, like a combination puzzle, it eventually came undone. Relieved, I moved on. On reaching the belay, Rob led the next traverse pitch over to the start of the upper Hidden Chimney route where we all congregated at the base. We could see up ahead that Florian was leading Richard up the chimney pitch when a skip load of spindrift came down and burst onto Florian’s helmet in a big ‘poompf’. Danny guffawed in response. I led the first pitch up into the chimney and agreed to create a belay to allow Rob a more interesting led up the finish. I set off, climbed up to a cave and created a belay. Danny came up just after and carried on out to the end and untied. I belayed Rob up and he took the next pitch up over my head and out to finish the climb. The rope eventually tugged for me to move, but I had some delay with some rope faff. In my head I could hear Michael’s previous advice about rope faff “at a crag it’s just a nuisance, but see oot on a winter route, it can be a killer”. I was in no danger though, as I was quite cosy in the wee cave and had a good supply of Haribo, but perhaps the same couldn’t be said for Rob and Danny waiting up on the exposed plateau. Faffing about with the ropes did test my cool, finding that I have none whatsoever. I eventually shoved the fangled ropes half into my rucksack and the remainder coiling around me and carried on up. I discovered that the top of the climb was only one move above my belay position and met with Danny and Rob at the top. Danny, not wanting to hang about any longer showed us a clean pair of heels, while we sorted out our gear. We headed back down into the corrie and caught up with Danny and had a tiring slog through deep powder snow back to the car. At one point, appearing briefly through the whiteout, we were surrounded by dozens of ptarmigan, unfazed by our presence as we passed. We were to meet the rest of the club back at the local pub. On the way there Danny enthused about the ‘massive roaring fire’ that we could all sit around and share stories from the day. The pub was actually packed out with locals watching a rugby ball game. The TV was mounted just next to the fire so a large exclusion zone forced us away from the fire and into a huddle in the corner of the pub. Most of the Lomonders has already given up by the time we arrived, so we had one pint and headed back to the hut. That evening we ate and drank while sharing stories from the day. 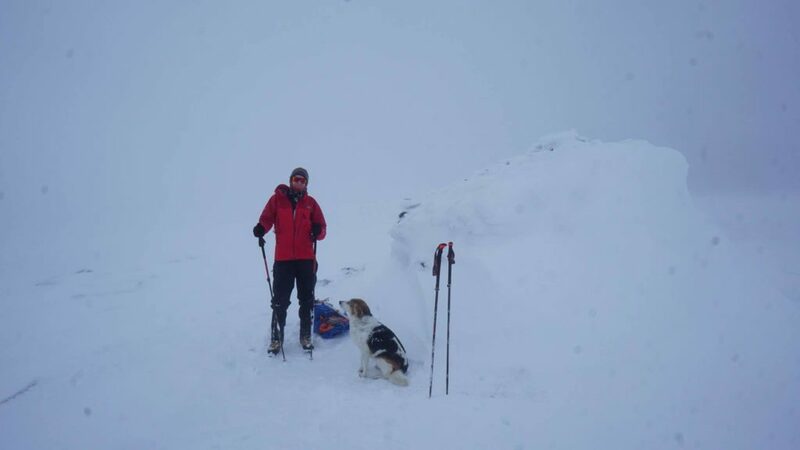 Guy and Clare had a good day on Forcan ridge, despite having to turn back and spent some time floundering in deep snow. Another pair in the hut joined us and shared their tales from doing Invernookie. The next day, Steven was planning to do a Munro but the enthusiasm of doing any more physical excursion had already left me, so I hooked up with Guy for a car ride home, stopping in for some breakfast on the way home. 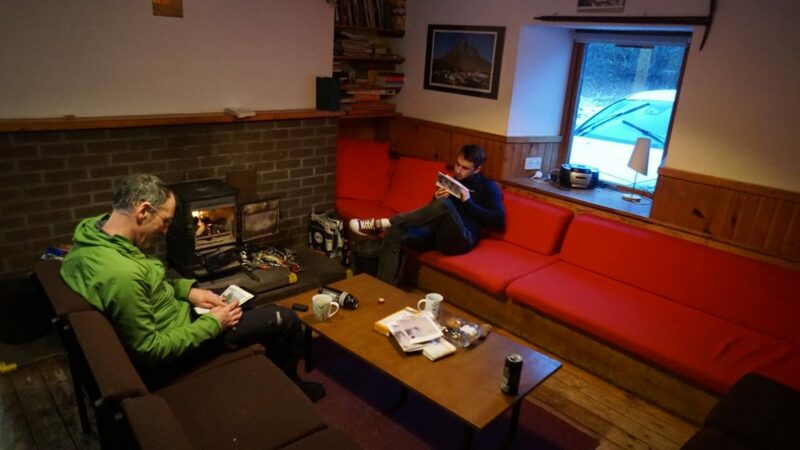 Steven managed his Munro Meall Chuaichon and Richard and Florian went off hiking. It was a good meet and probably time to hang up the winter gear for a few months.